In this second part of the post I continue exploring org-chart possibilities we have for our Localization team and where we might have the best fit. In part 1 I covered 3 typical models we tend to see at organizations. What structure could be the best for a Loc team? The way I see it …. that’s the coordinated model; as long as Loc is setup as a shared service. This is the winning formula: Coordinated model+Loc setup as a shared strategic partner. Yay! In that setup we have a dedicated team focus on localization. Loc as shared services offers many advantages . But, what does it really means establishing Localization as shared service? This means Localization services offer is the “default” within the company, so all localization activities within the company go through Loc team. During my career I’ve been in different orgchart setups. - sometimes Hybrid (some of the services go through Localization team but others may not. For example marketing might use their own language providers). 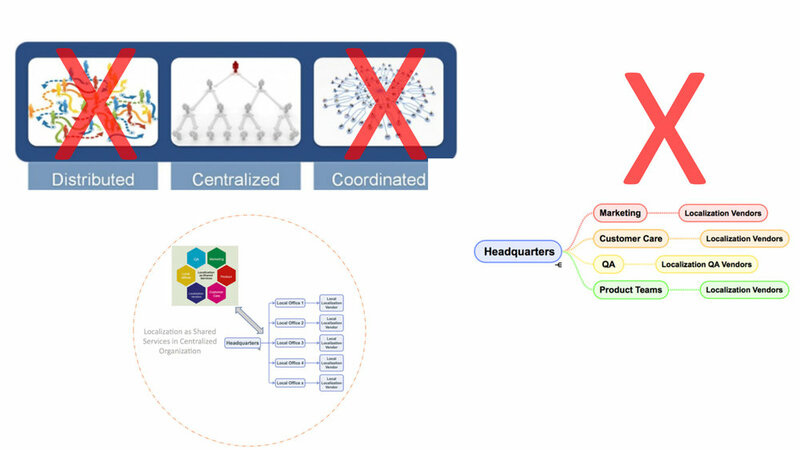 - Sometimes in an org-chart highly fragmented; with separate and- autonomous localization teams working on each of the different products. There’s not a one size fits all, however working with multiple departments can lead to confusion, unnecessary re-work, and worst of all, errors in final products due to a lack of a coordinated strategy. But why establishing Localization team as a separate entity, as shared services tends to work nicely? However when we establish Localization as shared service we are going to get a number of positive outcomes, keep reading to have a better understanding of the advantages when establishing Loc teams as shared services in org charts!! 1. A localization lead stablished as a shared strategic partner will be managing/answering directly the linguistics/freelancers/LSPs in a very efficient way; since many questions tend to be the same, instead of answering 1 question 10 times for each of the local offices/language partners, we might keep a Google doc (or any other questions management tool) and we post there the answers visible to everyone working in the project. 2. A localization lead stablished as a shared strategic partner will be managing all communications between the company’s headquarters and the local offices with a greater clarity and alignment. 5. A localization lead stablished as a shared strategic partner will be overseeing and running customer satisfaction survey in a very efficient manner. 6. A localization lead stablished as a shared strategic partner will be managing and tracking a global linguistic quality program and defining relevant metrics. We will be able to know how good (or bad) our quality is. 8. A localization lead stablished as a shared strategic partner will be offering an easier to scale solution. We would not have to reinvent the wheel every time we want to enter a new market. 10. A localization lead stablished as a shared strategic partner will be visualizing/tracking ROI per language per product. Productivity metrics are also possible to define and manage as the workflow is centralized. Without a Loc shared services, without centralized tracking system, we will have difficulties to know how much we are spending, who’s spending it, and exactly what we’re investing in. That sounds like a recipe to get in troubles with the financial controllers within our company very soon! The matrix structure is here to stay, but its complexity can be minimised, and companies can get more value from it . The way a company organizes itself—how it allocates responsibilities, how it organizes support services, and how it groups products, brands, or services—can have a substantial impact on its effectiveness. Global companies find structure difficult because there are no simple solutions, but Localization teams play a crucial role in this Globalised world we are living nowadays. A shared service loc team offers new ways to manage complexity. On top of all the advantages listed about there’s one more thing!!!! …..
A Localization team established as a shared strategic partner can help us to achieve the level 5 in the Localization Maturity Model, the highest level in the LMM we might aspire! and hey, let’s be honest, be on the top of LMM model, and being seen within the company as an essential function to drive profit feels good. I hope you have found these posts useful, There are different ways to put localization into play for your company. If you have the chance… put yourself as a shared service offering a central solution and central services for everyone within your organization. At the beginning you might feel overwhelmed for the high amount of stakeholders to satisfy … but in the long run, you’ll be happy to see that scalability, efficiency and visibility is not an issue anymore. 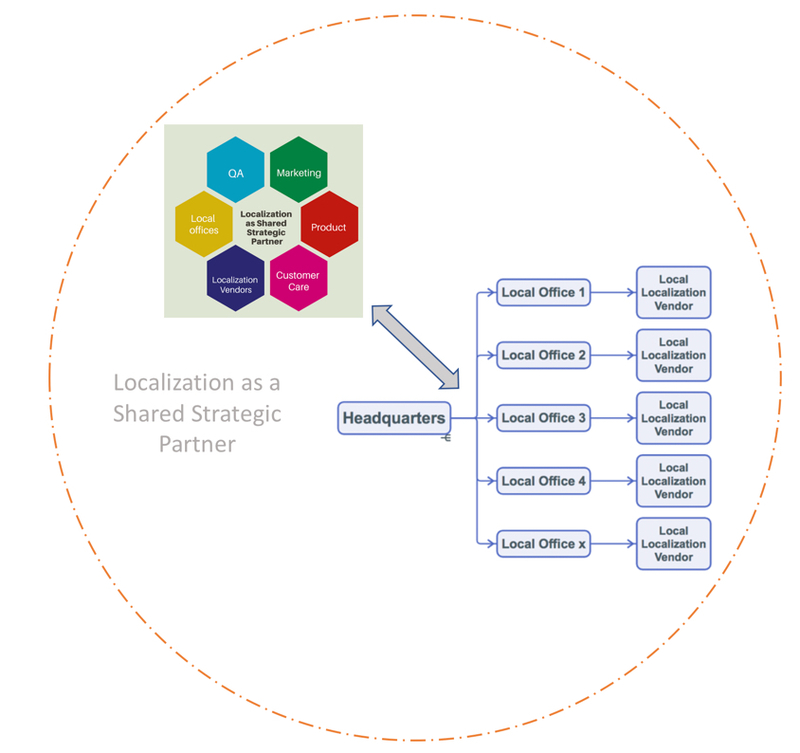 Are you currently a Localization Manager deciding how to organize Loc within your company? Or maybe you already completed that journey? What lessons have you learnt? What tips and guidance would you share with someone who has interest in understanding where to place Localization in the org chart of his company?